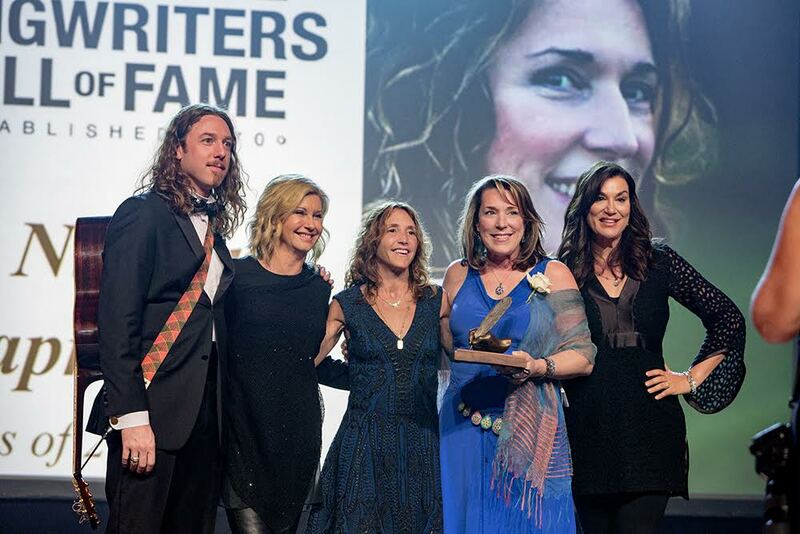 Ernest Chapman, Olivia Newton-John, Annie Roboff and Amy Sky induct Beth into the Songwriter’s Hall of Fame, Oct. 9, 2016. Songs have always found me. Leaking in through a melody as it to opens up from one note to the next, or taking my voice for a walk on a narrow path of twists and turns not knowing where it’s going. The other day I found a dusty old portable real to real tape machine with an ancient recording that I made when I was 12 years old. You can barely make it out through the muddle and tape hiss, but it’s the sound of me doing that very thing that I still do today when I stumble into writing a song. Traces of a melody and some nonsense syllables, the vowels already lining up inside the melody arranging themselves miraculously close to where they will be in the final lyric, the consonants and the meaning coming into form later out of the mist from this place of “I don’t know”. There’s a lot of uncertainty in this profession and I know I’m preaching to the choir here. There is a particular muscle that one develops from pouring their whole heart and soul into something and sending it out into the world (sometimes without proper clothing) and having no control over what happens to it, no control over the perception of its worth, and these days no control over how much compensation is received back from the energy, the value and the riches that the use of it has generated. But the uncertainty in the profession of songwriting should never be confused with the art of songwriting. I have tried to remember to keep my tender creative seedlings away from the superhighway of the music biz. To “write anyway”. Even if it’s only the trail of my life’s impressions and echo of my heart’s voice. I want to decorate the inside of my cave wall with the true expression of my experience of things and that is all that I can control. Tonight as I accept this award I feel like I’m standing in front of my tribe. Hunters and gatherers, scavengers, and “soul miners.” We work all our lives to dig out that little piece of truth from the depths of our life’s perceptions as we create, in three minute vignettes, these sonic offerings into the world. The power held in songs is immeasurable and I think, even though individually we struggle with our self worth, we all know the value of what we do. My songs have always known more about what’s going on inside of me than I have as I’m writing them. Some were written in anticipation of things that hadn’t even happened yet. If I had to boil it down to one thing I would have to say my lifetime of song wrangling has been about the life and death and rebirth of my confidence in myself and my faith in the ever-presence of creative flow, which, to me is just another word for oxygen. I really believe creativity is just hanging out like air itself waiting for us to breathe in and use it to live. Some of us have just developed a deeper lung capacity. But anyone can do this breathing dance in their own completely unique and original way. It’s not a competition. It’s a birthright. I moved to Nashville from Mobile Alabama in 1984 with my four-year-old son and my husband Ernest who had been pestering me for six months and threatening to start smoking again unless I sent a tape of my new songs to Nashville and get reconnected back into the music industry. This followed my three year lapse in songwriting after my first album had flopped miserably, thanks to its debut coinciding with the dawn of the disco era. Back then you could find me singing six nights a week in the open air lounge right near the elevators at the Riverview Plaza, loving being a new Mom but at a very low point of self worth and confidence as a songwriter. In one of those iconic moments in life, one night during my last set, Bruce Johnson of the Beach Boys came and sat down right in front of me and asked me to play another song I wrote. He ended up saying “you need to move to Nashville or somewhere where that there’s a music business.” If not for that I may never have had the nerve to move here and give it another chance. Creating music has brought me through the tragedy of losing my husband Ernest in 1994, and it has helped heal me on my journey through breast cancer in 2000. It’s carved a path in my heart to finding love again with my husband Bob and it has sent me all over the world from sitting on a cardboard box banging out a tune with a family in the township of Soweto to singing for the Queen of England in Scotland this past summer. These opportunities didn’t happen without much help along the way and it would be impossible to thank everyone who has played a part but you know who you are. In my state of anxiety about how not to leave anyone out, I decided to beg forgiveness on the front end if I don’t mention everyone by name and instead touch on just a few major instances where someone’s interaction with me caused a shift or opened a new door for me especially in those early days. Mac MacAnally, for letting me tag along with him one day while he was dropping of tapes where I got to meet Mac Davis and Angela Kaset and so many other artists and producers that my head was spinning. Tom Long from ASCAP who, right there in our meeting picked up the phone to call more than one publisher to say “I think you may want to hear this” which led to my being signed to a publisher. And so many great song men and women from Meredith Stewart to David Conrad who helped shape my growth and success as a songwriter. Jody Williams, for calling me up one day out of the blue just to say he’d heard some demos of mine and was deeply moved. He has no idea what good timing that was for I was really feeling down that day and ready to give up. Jim Ed Norman, who signed me to Reprise Records and gave me creative freedom and many many hours of council on being and artist and songwriter. Don Schlitz who invited me to step into the sacred circle one night and play one at the Bluebird, and then invited me to write the song “Strong Enough To Bend” with him. Rodney Crowell, who so masterfully helped me get my balance back during the making the “Sand & Water”album following my husband’s death. The many artists and co-writers who have taught me so much and have always had my back. All these amazing artists on stage tonight who have blown me away! Thank you Kim Carnes, Pam Tillis, Emily Saliers, Bill Lloyd, and my beautiful son Ernest who has inspired my whole life and thereby my songs. And thank you Amy Sky & Olivia Newton-John for flying across the country to sing me into the Hall of Fame tonight! Annie Roboff, my best friend who has been such an inspiration to me in life and who has repaired my songwriting compass many times. Co-writing with Annie is like getting an extra hemisphere and a few more floors of imagination in the tower of song. From there the movie speeds up and the vortex of thank you’s jumps far beyond the time that I have tonight. But I do just want to add how grateful I am for the warm deep love I’ve received from England, Scotland Wales and Ireland thanks to so many who have supported my music across the pond, from Terry Wogan and Paul Walters, to Bob Harris and all the folks at the BBC, Proper Music, and so many loyal fans. Who, like Nashville, always put the song at the top of the list. The first major music event I ever attended when I first moved to Nashville was the Songwriting Hall of Fame dinner. To be inducted this year into this profoundly amazing group of human beings is beyond the highest honor I could ever imagine receiving. Thank you NSAI & Hall of Fame, family and friends — especially my mother and father who have always celebrated and encouraged my creativity. Around 1992, I was invited into this family of fans by a woman I am no longer in touch with, although I remember her fondly whenever I listen to a BCN offering. She had me lie down in front of her fireplace, and played the song “Emily”. When it was over, there were tears flowing from both of our eyes. I went and bought the CD the next day. Throughout the years, at every low point of my life, when Loves I hoped would be the one proved untrue, when friends or family were leaving this earthbound existence, when employment seemed and proved to be fragile, I could count on finding a BNC tune to reach down into the well of souls and give me hope, and know that someone else understood. Congratulations, and I hope the Gifts you have been given continue to be, in turn, given to us. “How light the heart that’s full”, indeed. Just as you have written from the heart and from some periods of gut wrenching sadness, so your songs have given me such deep solace in times of a similar kind of sadness. I thank you for that comfort, and for the joy of sitting right in the front row at the Corn Market theatre in Newbury some years back, loving every minute of your concert, and cementing the conversion to loving you as much as I do for my husband, who has at times been the reason for the sadness. The words of your songs speak volumes, and convey feelings which he has not always been able to voice himself. When will you be back in the UK? Congratulations by the way on your new status, in the Hall of Fame. You deserve it! Congratulations, I am so deeply happy for you! Let’s hope that our path will cross again. I have always been moved by your songs, and by that ability, held by few, to match a perfect lyric with a stunningly appropriate melody. I have no idea what it takes on a personal level to pour out your innermost thoughts and feelings, reflections of times both joyously happy and infinitely sad, but I am truly grateful you make that effort on my behalf. I once dragged a reluctant 19 year old daughter along with me to the Birmingham Town Hall in England to see you live. She was as captivated by you as I was – thank you for all the music… don’t stop!! Beth, that is a beautiful speech.! It touched me. You’ve gone through so much and you’ve given so much to all of us who love you. You are a beautiful, special, wonderful human being, and I do love you with all my heart. Congratulations Beth. What an inspiring and inspired adddress. Every blessing to and yours. Looking forwArd to meeting next time you’re in Ireland. Seasons greetings. Brian Darcy. You do not know me but I am a huge fan. You are magical to me and have touched my soul, my heart, and my own creative desires. Thank you for publishing your beautiful speech as it supports all I know about creativity, being who we are, and not being afraid. What a process it all is. Thank you again. And keep dreaming about the spring inside the tree—it always returns. From a choir on Gunter AFB to tonight… Congratulations you are a blessed gift to this world. Congratulations, Beth. Thank you for the beautiful and wise words. All the best to you. Beth, Congratulations, and so richly deserved! Your heart writes so much of your music, and the lyrics, especially with you singing them, convey “I’ve BEEN here, I KNOW how this FEELS”. I lost my wife to breast cancer this year, and so many of your songs helped me so very much to get through this. I’m a church music dir., and I also write and play piano arrangements of old hymns. When I’m playing them I’m oblivious to everything else, and people have remarked that I seem to be totally inside what I’m playing. The best response I’ve come up with is that I don’t play it, I wear it. That’s what it feels like. And so many of your performed songs sound that way, infused with the genuine emotions that the lyrics and music portray (No One Knows But You, Say Goodnight, Not Goodbye, Sand and Water…..) We had a ministry at an earlier church that sang at a nursing home each week (I accompany a group of seniors doing that this month), and Like a Child brought tears the first time I heard it. Thank You and God Bless You for the joy and for the healing you have brought to so many, myself included. Merry Christmas and Happy New Year. Beth, that is an awesome speech. i remember that great day, when we first met you, you are such a caring and wonderful person. Your heart is a beautiful…… Love your music, congratulation!!!!!! May God continue to work through you and bless you, you’ve certainly touch the hearts of so many, especially, my spouse and I.
Dear Beth…..Your music has meant so much to me for so many years, and I have never sat down and told you. “Sand and Water” carried me through the sad years during the time that I lost my husband far too soon, as you had lost Ernest. I know the words to every song, each has brought me endless comfort and now joy, after many years. I have gifted “Sand and Water” to friends who have suffered losses and they, in turn, have done the same. Thank you for being such a special person with a special gift. Just a note to thank you, Beth. Your music has been a touchstone for me for many years. I lost a close friend in 2001 and your “Sand and Water” album was instrumental in helping me grieve. And just a few weeks ago another friend passed away unexpectedly — I was intuitively drawn again to this timeless collection of songs to lean into. I can’t really describe how it works — that’s part of its magic — but there is an uncanny alchemy in your music that somehow connects directly to the human spirit. I don’t know how you do it, but I’m so thankful for your special genius. I’m thrilled to learn that you’ve been recognized with this great honor – congratulations! I am remembering you at the cafe in piermont ny. You were so raw and full of emotion. Bonnie Raite was in the audience and got up to sing and support your tenderness. I was struck by love and awe. Thank you for your songs and giving.